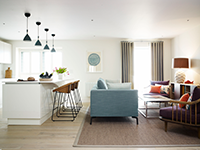 Set in the heart of the award-winning Chichester Marina on the entrance to Chichester Harbour, the Salterns are a collection of nine luxury self-catering apartments. This stylish accommodation offers a choice of one and two bedroomed spaces each uniquely designed with plenty of home comforts. With a backdrop of masts and bows visible from every apartment this is a wonderful location for those looking to make the most of Chichester and the surrounding area. Being in Chichester Harbour, an Area of Outstanding Natural Beauty, means that our guests have the opportunity to enjoy seeing some of the 55,000 plus waterfowl and waders that take up residence in the year. Additionally, throughout the year, birdwatching tours take place both on and off the water which can be arranged during your stay. Birdwatching enthusiasts will also enjoy the hide we have in situ at Chichester Marina and the fact Pagham Harbour Nature Reserve is only a few miles’ drive away.